Chris originally studied at Falmouth University of the Arts before becoming frustrated with the lack of proper drawing and painting tuition offered. 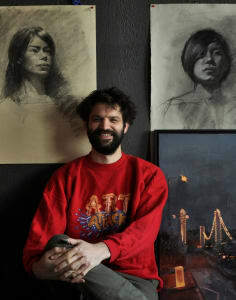 After leaving university he started studying at London Fine Art Studios in 2012 (formerly Lavender Hill Studios) for 3 years before being asked to teach at london Fine Art Studios in 2015. The studios taught Chris the traditional craft of drawing and painting which gives the students the tools to draw and paint anything using the method of the visual abstraction. This method breaks down what we see into simple elements of shapes values and edges, with these tools Chris went onto win various awards. These include winning runner up young artist award and the John Purcell paper award at the Pastel Society, exhibiting there in both 2013 and 2015. He also competed in the Sky arts portrait artist of the year 2014 and recently asked to exhibit in the Federation of British Artists, Futures exhibition in 2016 winning the Jacksons One To Watch prize. 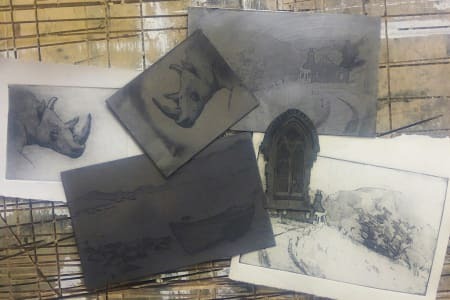 As well as teaching the craft of drawing and painting Chris also runs a print making workshop, teaching the traditional skill of intaglio and relief printmaking. Printmaking is a great way to explore the myriad of ways to create marks on paper and can be as expressive or as refined as one would like, there are endless ways to experiment. Awesome teacher, really chill; incredibly talented guy. Great session. Wholeheartedly recommend. I really enjoyed this lesson. Chris is a very patient and talented teacher. The 3 hours session took place in his personal studio where you can see some of his great work. 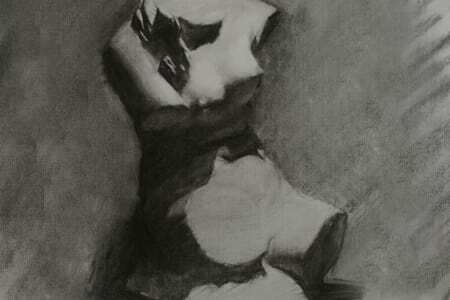 I would recommend him to anyone wanting to learn the fundamentals of drawing.